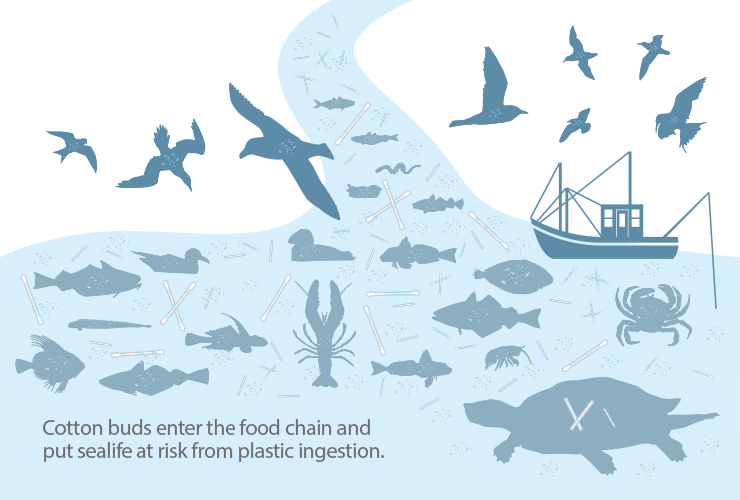 Ingested plastic has the potential to result in bioaccumulation of toxic chemicals in the bodies of marine animals. These chemicals are either contaminants that have accumulated onto the plastics while they have been in the environment, to components of the plastic itself which have been released as it breaks down. The other aspect of ingestion in the case of plastic cotton buds is their long thin form. This can cause physical damage to an animal's entire digestive system, from the mouth and all the way through the intestine.If broken, for example through becoming weathered and brittle, the cotton bud stems can be even more dangerous due to ragged and sharp edges. In addition to these risks from ingestion, plastic is known to be retained in animals' stomachs. There it may impede their normal dietary habits, either by making them feel full and therefore preventing them from eating, or by impeding their digestion. Both of these result in malnutrition and eventual starvation.